As you know notepad involves in creating many useful tricks and producing some fun and real tricks. Just like our previous post "How To Lock The Folder In Pc Without using software" the usage of notepad was on top and the work was done by notepad, and so many other tricks are also come in the middle using notepad, we will post other tricks very soon using notepad. But here are just a collection of 4 cool and some fun. You may know or not. More notepad tricks will be discussed later because if we discuss it now then the post will take a long time to read, So nothing more, turn to the tricks given below. time and date at the end of the your text you typed. notepad as a personal diary. the number of the flight (i.e. Notepad reads the file back in that it seems to lose its mind. 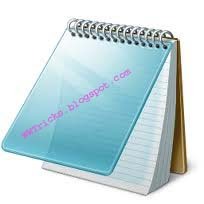 We also posted some more impressive notepad tricks that we hope you will like it so must read our new posts on notepad. Now that is called a helpful post. Thanks but make it more clear next time. Nice work carry on. We will try our best to bring you some new and best. Also collecting some More impressive Notepad tricks. can u post how to access other computer drive without sharing. ?